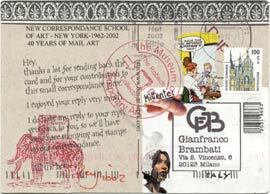 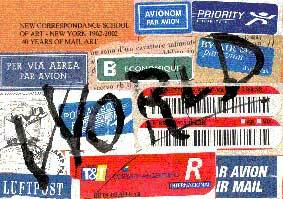 The project 'New Correspondance School of Art - Correspondance Art - Old School' is inspired by Ben Vautier's 'The mailman's choice' and was created in 2002 for the Mail Art Project '40 years of Mail Art' by Anna Boschi. 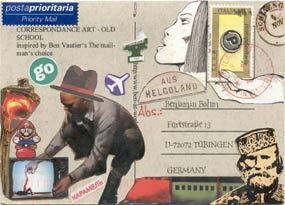 It consists of postcards predesigned by Böhm, which are worked on and send by other artists back to Böhm. 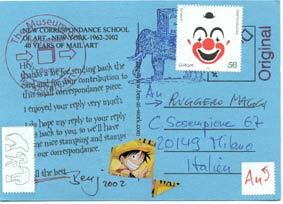 He sends them back again. 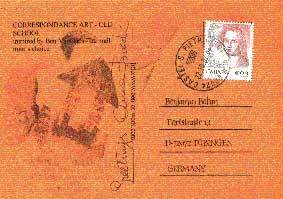 The original text by Böhm already provides already the answer to the works sent and at the same time describes the idea of this 'small correspondance' project. 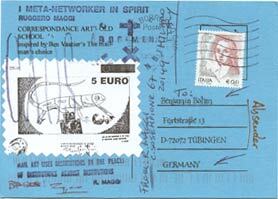 Participants were some Italian artists, among them the curator of the Mail Art Project, Anna Boschi (see below).